One day I was browsing something on Mozilla and everything working perfectly and I just open Google chrome, started typing mail.google.com and press enter, I got shocked because I got an error similar to no internet connection. I just moved to Firefox and everything was working fine there as was before. I just started thinking whats wrong with the Chrome. After proper closing all the opened tab I restarted my computer and again try to open mail.google.com, Now it was working perfectly. 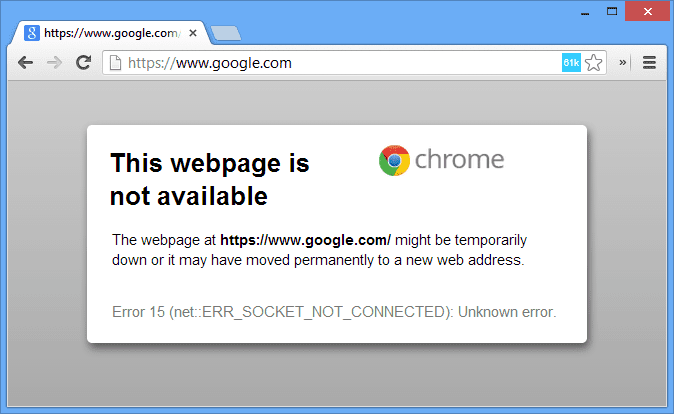 Open your Google Chrome and type chrome://net-internals in the address bar. Switch to the Sockets tab and choose Flush Socket Pools. Now open Gmail or Google.com in Chrome and the site should open without problems.